Adding feeds to your CastleCMS website is simple, and lets your users get the information they need, faster. When new content is published to your website or online service, you want it to be made known to your world of patrons and content consumers as soon as possible without requiring them to check back with you every few hours. Although CastleCMS does allow integration with the big players in social media, you may have visitors who want to follow you without signing up for Twitter or other similar platforms. This is just one of several reasons that have caused syndication feeds to become a standard on the web since their inception in the mid 1990s. There are a few different standard formats that web syndication feeds are expected to be in, each of which have its place in managing certain types of content. RSS and Atom feeds are widely used, general-purpose feed standards allowing all kinds of content to be represented by providing titles, descriptions and summaries along with links to each item. Other standards are more geared toward specific types of content, such as Google's KML for content that includes location data so the feed can be displayed on a map, or Apple's podcast standard which allows iTunes and other software to stay on top of new episodes. CastleCMS can generate all of the mentioned feeds, seamlessly, out of the box. 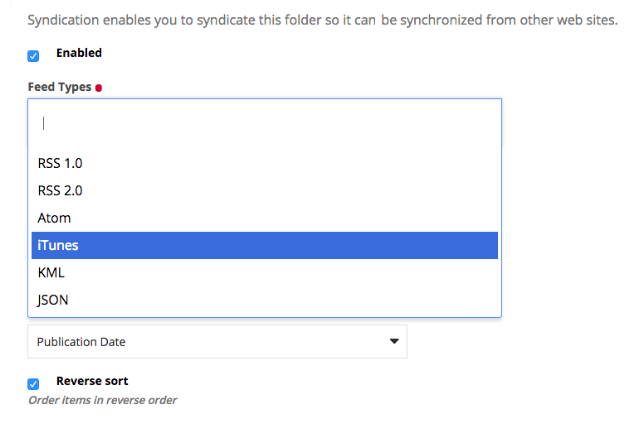 All you need to do is navigate to a folder that contains published content which will provide the fields necessary to generate the feed, and then click "Syndication" in Castle's toolbar to see the options pictured above. You will also see a few more customization options regarding tags for third-party services like iTunes. Once you've selected what type of feed you want, click “Enable” and view your feed by adding "/feed" plus the proper extension to the URL for the folder you just configured for syndication. So, if you have a CastleCMS site running at https://example.com with a folder called sample_folder, you can view a JSON feed representing the content of the folder at https://example.com/sample_folder/feed.json after completing the configuration steps. If sample_folder contained items with location data, you could select the KML feed type and view it at https://example.com/sample_folder/feed.kml, and so on. Syndication as a model for sharing content saw its beginnings long before the internet. Print, radio, and television syndication made content available to more consumers in less time, just as web syndication continues to do today. Take advantage of the possibilities with CastleCMS.